We continue to look at opportunities to improve accessibility of the motor tax office. We are also looking carefully at how we provide information to our customers to ensure it is available in suitable formats. Below are some examples of actions we have taken. Two Accessible parking bays located at the left hand side of the building. The accessible entrance is located at the left hand side of the building beside the parking bays. Additional parking has recently been added to the rear of the building. The entrance into the motor tax office has level access and automatic doors. An automated queuing machine is in place with both visual and sound elements incorporated. An induction loop for hearing aid users is in place at all counters. The male and female toilets have accessible toilet facilities. They are on basement level and can be accessed via the lift on ground floor. All staff has received disability awareness training and customer care training. You can renew your motor tax securely online. Log onto www.motortax.ie and follow the step by step instructions. All you need is a credit card or laser card, motor insurance details and the pin number on your tax renewal form. You will receive your disc within 4 working days. 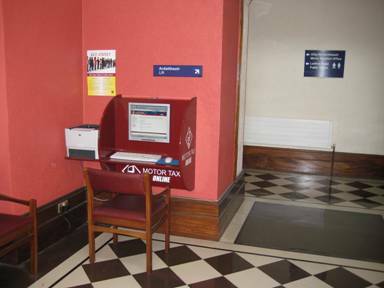 There is a on the ground floor of the courthouse where you can renew your motor tax online. It is located opposite the lift and is positioned at an accessible level. 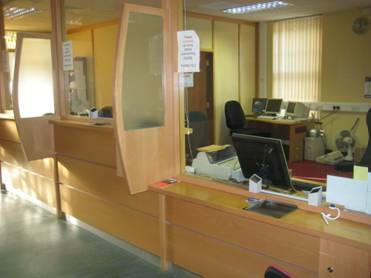 Application forms are positioned at an accessible level at the door of the motor tax office. They can be accessed until 5pm. For information purposes Driving License and Tax Renewal Forms are available in eight different languages. These can be used to help you fill out the English forms. An express post service is available. It is located at the door of the motor tax office and can be accessed until 5pm. Customers should ensure that all envelopes are properly sealed and fully inserted into the post box.